Ms Harris Namutebi of NCD cuts a cloth to demonstrate to pupils and parents how to make sanitary towels for menstruation in Budadiri in Sironko district. Photo by David Mafabi. 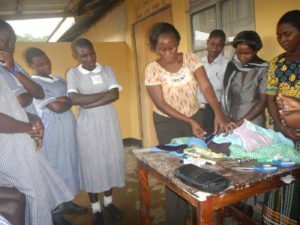 SIRONKO-An local Non-government organization in conjunction with the Sironko district local government is skilling pupils in making sanitary pads from local materials to ensure girl -child stays in school even during menstrual periods. The project started by Network for Community Development [NCD], a local NGO, targets pupils mainly girls from Primary Three to Primary Seven is piloting this in Busiita, Buhugu, Budadiri girls and Nakirungu primary schools in Sironko. According to the director NCD Cassim Gibusiwa the teachers, parents and pupils are being taught by their NCD how to make re-usable pads and that these later will in turn teach others. “All this is being done to curb female pupils’ absenteeism from school during menstrual periods and to enable them attend the entire education cycle to perform well in national examinations,” Gibusiwa said. Mr. Gibusiwa while launching the cheap and re-usable sanitary making in Budadiri for primary schools 2 Feburay said in rural Uganda, girls and married women who cannot buy manufactured sanitary pads resort to using old clothes and other materials to cope with menses. He revealed that a study of menstrual management in Uganda by International Water and Sanitation found out that female pupils mostly in rural areas stay away from school for at least eight days of study in a school term because of menstrual periods. “And eight days on average translates into 11% of the total learning days in a year which impacts on the academic performance of girl-child in national examinations 220 learning days in a year,” Gibusiwa said. According to a United Nations International Children’s Emergency Fund (Unicef) survey report conducted in 10 districts between 2012 and 2013, it is estimated that about 23 percent of adolescent girls between the ages 12-18 years that start experiencing menstrual periods lack adequate menstrual protection such as sanitary pads and that they usually keep out of school when the start their periods. “It’s a school absence rate that is hard for the girl to make up for and partly accounts for girls dropping out of high school,” reads the UNICEF report in part in part released in August 2014. The Education officer Sironko Ms Sarah Bugoosi said the menstrual periods have greatly affected the academic performance of the girl child. Ms Harris Namutebi the main instructor at NCD said NCD has initiated the Sanitation and Hygiene program Busiita, Budadiri girls’, Nakirungu and Buhugu primary schools in Sironko. “We support the girls with sanitary pads, buckets and wash basins to enable girls to take baths during their menstruation period. Additionally, NCD is also training teachers, parents and the young girls how to make locally clean but affordable sanitary pads from local materials for themselves,” Namutebi said. She expressed concern over ignorance of menstrual hygiene in the communities and urged government and responsible organizations to increase sensitization for people to understand that menstruation in women is normal.